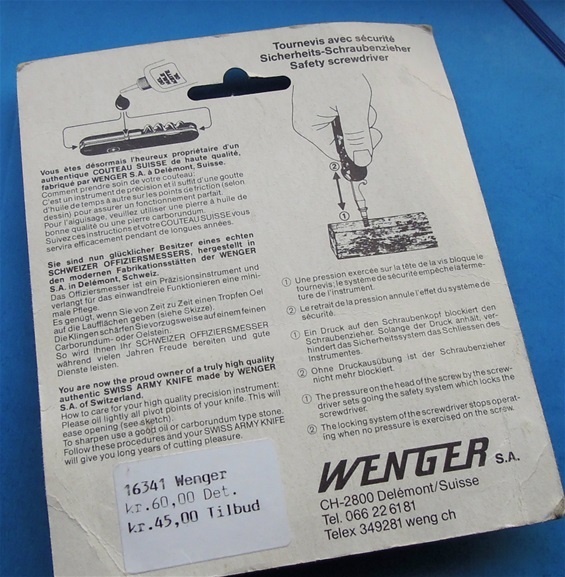 On the picture you can see Wenger 85mm knives from the early 1980s until approximately the year 2000. The use of hot stamp or embossed emblem on economy or budget knives with silver color was used in the 1980s and also on some later dates as well. On the picture is a mix of budget, advertising and main category knives. You will find embossed emblem on budget knives and advertising knives. 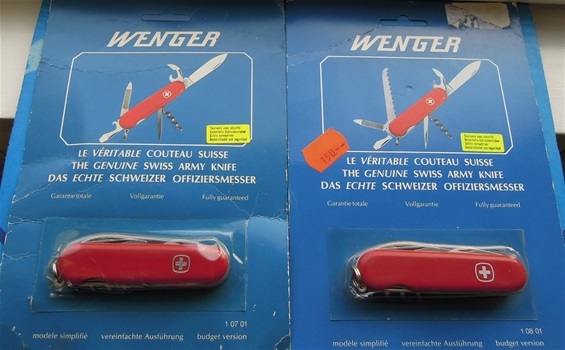 We have the same with Wenger as Victorinox. Some categories are made with some less expensive production methods. You will find advertising knives that are regular and economy made. There is a mix of everything with Wenger depending on requests. The use of a Pad Print type emblem you can find from the early 1980s and on different years as well depending on category. I have also found some knives with advertisings that are interesting for collectors and should be worth knowing. If you want to date the year of a knife then many use the push lock screwdriver as a certain guide. I have found Wenger knives with Pad Print and no push lock screwdriver that I suspect are made in the late 80s; these are economy made knives I believe. I see signs that we have some of the issue with Victorinox dates that are the main line VS economy made knives. The use of different Pad Print advertisings can be found from the 1980s and up usually and in the 1990s it is common. There are many variations in the dates and knives. The regular or main line from Wenger usually has an inlay type emblem that identifies it as the main line or regular. The type on the top is an inlay type and also these got an evolution. The inlay emblem identifies together with the tang stamp. This was so extra important as well when Wenger did the large change in the early 2000s and up. The evolution and the Classic Range got special inlay emblems. The quality on the Wenger budget knives is well and they are made for use. Usually there are more cost effective steps in the production and details that are the only difference. They are genuine Wenger SAKs. In some cases it is also the blister type or front display card package that can identify it as a Budget knife. The name Basic is also a category used on the 85mm knives by Wenger and these are basic made and therefor it is a type of Budget or economy made knife as well. basic can also be the use of basic functions and a category made in that sense. Also have in mind the use of different colors on the knives. This is also depending on the time in history. In some later dates some colors like blue can be used on some advertising knives in an economy sence. At some times in history it was completely different because different colors was very expencive. Also have in mind that the push lock screwdriver can be found 1983 and up on the economy embossed knives and advertising knives too. One major difference between Wenger and Victorinox is the tang stamp. There is only small changes on the stamp from the late 70s until the refreshed knives in the early 2000s.This stamp seems to be used on Basic, Budget, Regular, Advertising knives. There are some interesting differences but it need further research. The three knife W backside stamp i have seen from the late 80s. The inlay used on regular and some other categories from 1976 and 1988 is an inlay type. Also have in mind the new inlay on the refreshed Classic knives in the early 2000s. This and the type on the Evolution handles is very well made and with such a good precision that it is mistanken sometimes as a print. It does tell me that the emblem is not just for design but it is the sign of superior manufacturing. 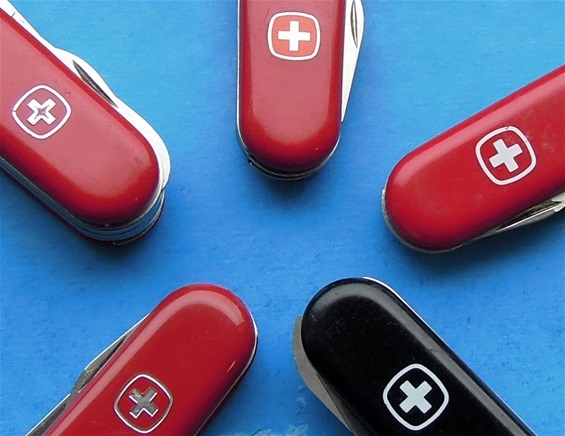 It is the identification of the iconic status and a symbol of Switzerland. The inlay is integrated in the scales itself with a new method. I am lucky to have a good selection of Evolution and EvolutionGrip knives with this feature. It can be difficult to date the front case card package used on Budget and Basic knives. On the pictures are knives from the 1980s and early 1990s. There are sometimes different labels and information on the backside of the card. It is most common to find models with the pad print type emblem but also hot stamped/embossed. The pad print is usually white and the embossed silver color. Some of them are desinated as a Budget knife under the front case. The advantage with these package types is that it is possible to date the knives because it is possible to see the springs and the information on the cards are also helpful. On this picture you can see two Budget knives and the left one got the embossed hot stamped emblem, both got the push lock screwdriver, these two knives are from the mid-1980s-1990s, the left one is probably 1985-1988. The backside of the card is completely blank with no info. There are large cards and smaller cards depending on applications. I have one Budget card with Wenger label code on the backside. 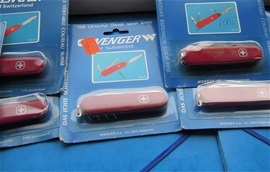 Wenger refer the knives in this package type as Basic and these are some place between Budget and Regular line. The backside got information and i have some with the Wenger code labels. I have seen this type of package from the 1980s and up. So what can we make out of the information at this time in history? For sure there was a competition between the Brands on the market. It is not only that both Brands got a product selection designed for the complete picture. It was also a competition between the two for the markets in the world. This goes for advertising knives, regular and economy made knives. It is the same many places and it is so in the 1980s time window and during most of the history between them. There is one important detail with the card package and on the Budget knives. Usually the functions are diplayed with a drawing or label on the card. The functions are closed into the knife body. In a some cases this is not always correct and the true functions are then labeled on the card with the number of the knife instead. Usually the picture/drawing is correct. 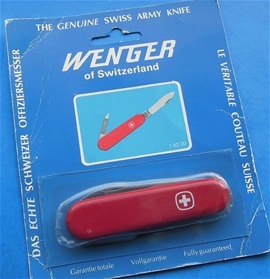 It is not so that Wenger mislabeled the knife or someone glued a different knife in the package. I have only one such knife functions that does not compare but it is labeled with the correct number instead. 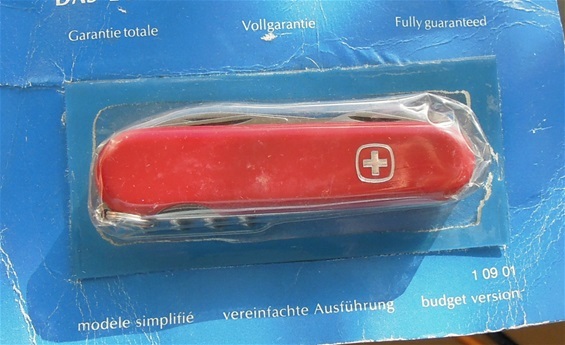 Here is my latest Swiss Army Knife and it is a Wenger budget 1 09 01 in the original package. The package is a little beat up. The knife itself is without a scratch and it has never been out of box. The backside of this is without any information, the knife got the locking flat screwdriver and it got the short can opener. It got hot stamp embossed emblem. I do not want to take the SAK out because I can see what is necessary. It should be a knife made in the late 1980s. Hi there is BOND here. 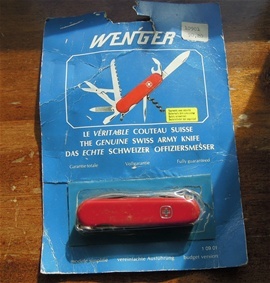 The Wenger finally arrived and it came with an inlay, like the type on the SAK that is in the top of your article. No chain. Thanks! Thanks for answer! Also do you know where to buy the Classic Wenger keychain? I will send some pics when mine arrives to home. Great article! Do you know if the Wenger shield is print in the late Tradesman? Thanks! Mitt navn er Geir Andersen og jeg samler på Wenger kniver. Jeg ser at du har mange av disse "budget" Wenger, kunne du tenke deg å selge meg et par av de? Hei Geir. Ja det stemmer de passer. Ja det er moro for jeg fant ut at de passer for en stund siden også. Er der noen følgere som har dem her tro? Jeg bor i bergens området, vet du om noen steder jeg kan få kjøpt flere Wenger flat type klassisk scales med Wenger embossing på siden?